The years of Chancellors Dollfuss and Schuschnigg's authoritarian governments (1933/34-1938) have been denounced as "Austrofascism" from the left, or defended as a Christian corporate state ("Stondestaat") from the right. During this period, Austria was in a desperate struggle to maintain its national independence vis-o-vis Hitler's Germany, a struggle that ultimately failed. In the end, the Nazis invaded and annexed Austria (Anschluss"). 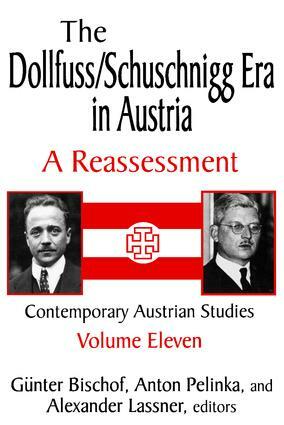 Volume 11 of the Contemporary Austrian Studies series stays away from these heated historiographical debates and looks at economic, domestic, and international politics sine ira et studio. Timothy Kirk opens with an assessment of "Austrofascism" in light of recent discourse on interwar European fascism. Three scholars from the Economics University of Vienna analyze the macroeconomic climate of the 1930s: Hansjrg Klausinger the "Vienna School's" theoretical contributions to end the "Great Depression"; Gerhard Senft the economic policies of the Stondestaat; and Peter Berger the financial aid from the League of Nations. Jens Wessels delves into the microeconomic arena and presents case studies of leading Austrian businesses and their performance during the depression. Jim Miller looks at Dollfuss, the agrarian reformer. Alexander Lassner and Erwin Schmidl deal with the context of the international arena and Austria's desperate search for protection against Nazi Anschluss-pressure and military preparedness against foreign aggression.